Note to readers: In November 2002, Rich Little blew through nine American presidents during a one-man, six-day show at the Majestic Theatre in downtown Dallas. He began with John F. Kennedy and ended with George W. Bush. Before The Presidents, Little sat down for an anecdote-loaded interview that dropped names ranging from Reagan to Richard Nixon to Johnny Carson, whom he briefly portrayed in the 1996 HBO movie The Late Shift. Little lately is supporting Donald Trump, in part because he thinks the country needs a dramatic change. More to the point, though, “From my perspective I’ll have a wealth of material,” Little told an interviewer in July during an engagement in Las Vegas. This article was first published on Nov. 12, 2002. 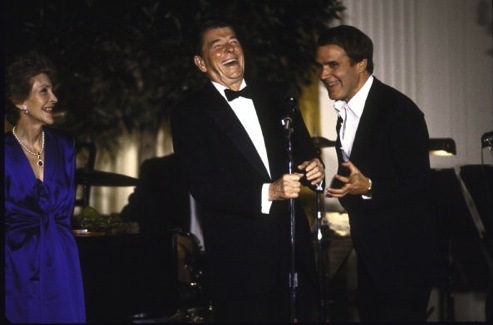 Rich Little once hung up on President Reagan, thinking he was an imposter doing a bad impression. Johnny Carson once hung up on Jack Benny, thinking he was Rich Little. And Rich Little still has a framed letter from an adoring fan who praised all of his great contributions to show business, particularly “Tutti-Frutti” and “Good Golly Miss Molly.” It was meant for Little Richard. “Maybe he’s got some letters telling him, ‘Your John Wayne is outstanding,’ “ Little says. These stories and many more might someday be in a book he’s been messing around with for the last five years. Tentative title: People I Have Known or Been. Makeup is essential for The Presidents, which begins a six-day run at the Majestic Theatre Tuesday night. Billed as both “touching and hilarious,” it stars Little as the last nine American presidents, beginning with John F. Kennedy. Gerald Ford’s former press secretary, Ron Nessen, co-wrote the script for a production that includes four other actors in supporting roles, principally Ginger Grace as all of the First Ladies. For his part(s), Little will be juggling wigs, fake noses and various other adornments in a game effort to keep looking presidential. Trim, tanned and jocular, Little is a nicely preserved 63-year-old who’s been doing impressions for his entire adult life. Canadian by birth, his first American TV appearance was in 1964 on Judy Garland’s acclaimed but short-lived CBS variety show. Little was just shy of his 25th birthday, and getting a pair of pants fitted at a Canada tailor shop, when he heard the news of President Kennedy’s assassination in Dallas. A popular young Kennedy impressionist named Vaughn Meader saw his gainful career end overnight. “After the assassination, the comedy was over,” Little says. “You can imitate and make fun of people that die a natural death or get older or whatever. When you’re tragically killed, though, the humor really goes away. So we do Kennedy in the context of history. It’s not a Saturday Night Live spoof. It’s a history lesson, a true portrayal with a lot of the humor coming out of the paranoia of a couple of presidents and the idiosyncrasies of others. Little has met a majority of the presidents he’s portraying. Ford is the toughest to flesh out, he says. Reagan, whom Little considers a pal, “was a little vague and a little out to lunch even back then as president . . . He loved to tell jokes and talk about his movies. He’d tell me these long, involved jokes. Sometimes they’d go nowhere, and there was no punch line. He first met Nixon at a garden party in California several years before Watergate undid his presidency. But seriously, folks, Little has an even better Nixon story, this one told to him by a friend who owned a Mexican restaurant in San Diego. Little encountered Bill Clinton at a fundraiser in Las Vegas. Little’s catalog of impressions numbers about 200, some of them all but retired. “Oh yeah, my Spiro Agnew and George McGovern aren’t too popular right now,” Little says, referring to Nixon’s first vice president and the 1972 Democratic presidential nominee. Little later seizes an opening when his interviewer foolishly tells him that everyone thinks he can do at least one impression. This leads to a very lame attempt to do Howard Cosell while the master feigns approval. Far better to end with another of Little’s show biz stories. “I once did a benefit where Gerald Ford and Frank Sinatra were in the front row. I had a podium made out of cork so I could trip into it and it would fall apart. I overdid it. I hit that podium so hard that it flew into a million pieces and I fell off the stage and landed in Gerald Ford’s lap!